Yoshiaki Sukeno’s comedy shonen manga gets center stage this summer season as it gets animated for television series. The official website for the series has partially opened and has revealed exciting details about the project. The hints about the animation’s airing period and the main staff have also been stated. This is a good news for the original manga lovers, who trails after the adventures of Hanazawa and Momiji in their quest for balancing the world. Sunrise Studio will animate the series, directed by Youichi Fujita, who is directed episodes from Gintama. Kento Shimoyama will handle the series composition, and the character designs will be by Kenji Tanabe. Shueisha Jump Square’s June Issue has revealed that Kana Hanazawa and Yumi Uchiyama will lead the cast as voice actresses of the series. Hanazawa will play the role of Sakura Ichiko, a 16-year old girl who leads a perfectly charmed life and is blessed with brains, beauty and health. Cheerful, vibrant and beaming with positivity, she has a strange abundance of Happiness Energy which is so contagious than it makes other people happy. However, this happens at the cost of sapping all the enrgy from her surroundings. Thus, the energy balance of the world tilts, which causes great danger. 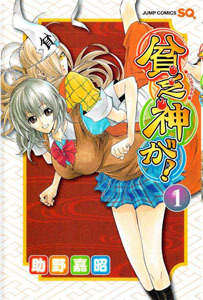 In order to resolve this dispute, Binbogami (Poverty God) Momiji, voiced by Uchiyama, targets Sakura and aims to remove her power of absorbing other people’s happiness. Her goal is to return all the energy which she has absorbed back into its rightful place. Thus, this will make Sakura normal. This plot was taken from a local folklore to which a family lives in scarcity as a god of poverty lives in their home. However, the god, being bored, started making sandals to which the family benefits by selling it. Noticing that the family is getting richer by the minute, the god leaves their home, sensing that he has lost his touch. The official website for the series can be found here http://www.binbogamiga.net. The original manga was first published in Jump Square back in 2008 with its 12th compiled book was shipped this April. The television series will bring comedy to fans locally this July.